Every year, the tactical segment of the cutlery industry continues to impress with fresh designs and new technology, allowing the serious user to choose from a bumper crop of offerings from manufacturers home and abroad. What started out as focus on combat knives 15 years ago has now broadened into a group of sub-categories under the "tactical" umbrella, which hone in on specific usage. Law enforcement and military personnel have always been the focus of the tactical genre, but the everyday user has become a big beneficiary in the tactical blade market as well. One of the key factors in determining the knife you'll choose is steel. What was once a simpler choice has now been made more difficult, as new manufacturers have jumped into the cutlery market with exotic blends of stainless steel, each aiming to be more efficient than the next. Crucible industries, whose latest offering is the S35VN, has dominated this category for the past few years, but other foreign manufacturers, such as domestic supplier Carpenter Steel and foreign giant Bohler-Uddeholm of Austria, have made impressive gains in the cutlery arena. The modern steels have advantages in that they are tougher, hold an edge longer and are more corrosion-resistant than non-stainless carbon steels. With those benefits, however, come disadvantages. The very toughness of these newer steels requires they be sharpened using diamond hones - an ordinary sharpening stone will not work. For this reason, many serious users prefer carbon steel blades such as 1095 and D2 — as they both can be sharpened using traditional ineans, and can even be edged in the field using a rock in a pinch. It should also be noted that some of the more traditional stainless steels, such as 440, could be sharpened without a diamond sharpener. Handle materials present a less imposing challenge for the user, simply because there are so many good ones. Micarta, a layered synthetic composite that has been around since the early 1900s, is still the most common handle on tactical knives, followed closely by G-10. Carbon fiber is still considered an exotic (read: expensive) handle material but all three are extremely durable. For the budget conscious, there are mold-injected Zytel and cord-wrapped options, while on the other end of the spectrum, titanium is an upscale option for folders. Organic materials such as wood, stag, and bone tend to fall by the wayside on tactical knives, but aren't out of the question. While folding knives have captured the majority of attention throughout the modern-day era of tactical knives, fixed-blades have always been at the heart of edged weapons armament. The reason is elementary — they're more dependable. Folders have all kinds of things that can go wrong, the most alarming being the failure of the blade lock. They also tend to be smaller, which limits their ability to handle tough chores. There will always be a need for large fixed-blade knives, if only for one reason. They can chop. When ever circumstances call for building a shelter and a knife is the carrying tool of choice, you'll need a blade of around 6" or more to effectively make things happen, and the thicker the blade steel, the better. Big knives are for big jobs, and shown here are two big ones: the Ontario RD 7 at the top and the TOPS Prather War Bowie knife at bottom. TOPS Knives' Prather War Bowie, a collaboration with Warschool founder Jeff Prathcr, is a modern classic. At a hair over 12.5" in length, the knife's 7.25" trailing-point blade hints at Bowies knives of old. Its corrugated Rocky Mountain Tread handle, however, is modern beyond all doubt and the 1095 high carbon blade steel makes this knife easy to sharpen in the wilderness. Prather, a martial arts expert, likes a knife this size for combat as well — and who are we to argue? 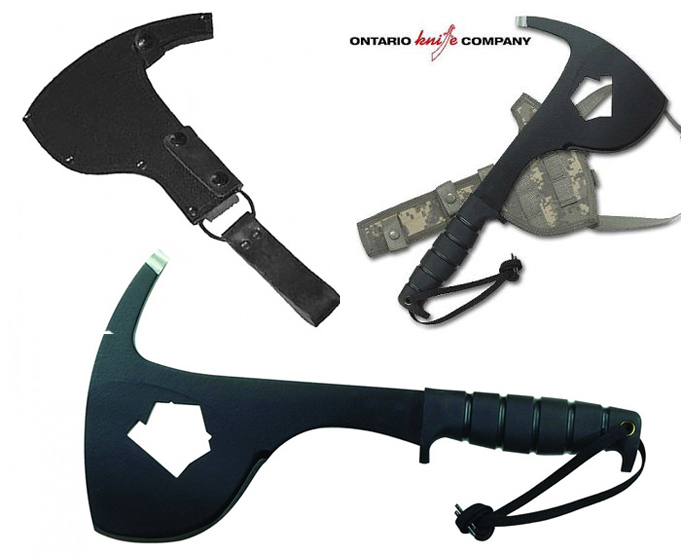 Ontario Knife Company has an extensive line of survival and hunting knives and bladed tools, but the updated SPAX is one of the best general-purpose outdoor tools you can carry. Two years ago I did a story about a hunter that fell between a melting ice shelf and the side of a mountain in Idaho, and he would have died had it not been for a small axe he carried on his belt. 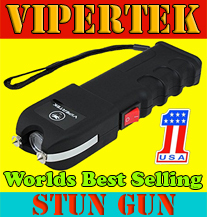 In survival situations, you need multi-purpose tools that don't create a lot of bulk. The SPAX is versatile and efficient, and it comes with a belt sheath to keep it close to your side. The 1095 carbon steel blade is powder coated, and the SPAX blade can serve to shop wood, cut rope, or hammer through ice. In emergency situations, the SPAX will break through glass windows and can cut through sheet metal, and the orange handle is large and comfortable for a secure grip. The blade also includes a wrench for fire hydrant and gas mains, so this is a favorite tool of rescue personnel as well. 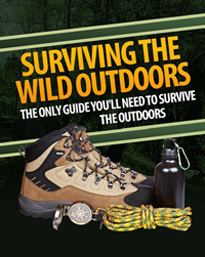 If you're in the outdoors, you need a SPAX. The updated SPAX from the Ontario Knife Company is one of the best general-purpose outdoor tools you can carry. 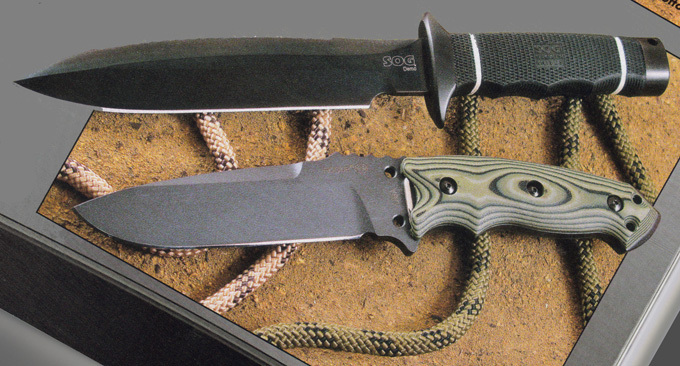 Ontario Knife Company's RD 7 Model is part of their Ready Detachment series designed by Jason Gingrich. The knife's versatile 7.5" clip-point blade of .25" steel take down small trees with ease and the high carbon blade steel makes it a breeze to re-edge in the field. If you like the RD 7 design, you'll be delighted to know alternate blade lengths are available ranging from 4.5" to 9.5". ABOVE : A fixed blade for all tastes. The SOG Demo (top) is an old design brought up to modern standards. The Hogue EX-F01 (bottom) is just outright modern. Hogue Inc. (yep, the pistol grip people) launched a folder line last year with famed custom knife maker Allen Elishewitz as their collaborator. This year they've announced the EX-F01 fixed-blade series to the line-up. Available in blade lengths of 5.5" and 7.0", the EX-FG1 features Elishewitz's slick, well-grounded design and a choice of handle materials, including the company's patented black, green and tan G-Mascus. An Alien wrench slips into the handle from removing the scales, which are hollowed out for packing away small survival items like fish hooks and such. The SOG Demo is patterned after one of the rarest Special Forces knives ever made. The companywent to great pains to produce a modern yet faithful rendition of the original Scuba/Demo used in Viet Nam — and succeeded quite nicely. Just under 12" in overall length, the Demo has a 7.2" double-ground blade with a straight cutting edge on the front and 5" of serrations along the back. Built tough, the Demo has a stainless steely guard and pommel and these, along with the blade, are done up in a black Tini coating for low reflectance. The finger-grooved handle uses Kraton for comfort and is checkered for enhanced grip; with all this you get a genuine black leather sheath. ABOVE : When stealth is of the essence, a skeletonized knife is easy to conceal. Chris Reeve's Professional Soldier (top) and Spartan Blades' Phobos knife get the job done. If you need to add stealth into your equation, skeletonized knives are just the ticket. Skeletonized knives are not new but have been coming on strong recently. These knives can be used as is or cord-wrapped for a more comfortable grip that keeps an emergency length of paracord at hand. Spartan Blades' Phobos is a compact 6.5" knife with a wicked 2.75" Wharnecliff blade that can be worn as a neck knife or carried in a pocket stored in its Kydex sheath. Chris Reeve's Professional Soldier is a collaboration with noted custom knifemaker Bill Harsey. This knife is 7.5" overall with a 3.375" drop-point blade and a cleverly designed cutout in the handle can serve as a shackle wrench! ABOVE : Cord-wrapped knives offer that little bit extra when needed. At the top is the Knives of Alaska Xtreme Model V, at the bottom the Ontario Ranger Shiv. If you want your knife cord-wrapped from the factory, you're in luck. Ontario's Ranger Shiv — one of many cord-wrapped knives in the company's line — has a 4.5" carbon steel blade that offers excellent protection in an easy-to-conceal package. Knives of Alaska offers the Xtreme Model V with a 5" partially-serrated blade of D2 steel, and there are other blade lengths available in this series. An added bonus for skeletonized and cord-wrapped knives is to be more affordable than knives with more handle materials. By far. the most competitive battles fought in the tactical side of the cutlery market are over folding knives. It's here new design ideas are tested and innovative technologies surface. Don't look for this to change, as folders, which offer more opportunities (such as locking mechanisms), make for an ideal platform for pushing the industry farther. In tactical circles, Chris Reeve is known as "Mr Quality", and has the industry awards to prove it. His Umnumzaan folder is a bulletproof work of art that is every bit as tough as it is good looking. At over 8" fulley extended with a 3.675" blade, the "Zaan" is a large folder designed to perform a myriad of functions from combat to field duty. The handle is made of thick titanium rails; Reeve's sturdy frame-lock blade securing mechanism, which is popularized, is one of the strongest in knifedom. Cutting-edge design is never more real than in Spyderco's Vallotton Sub-Hilt folder. The company had been wanting to do a collaboration with noted knifemaker Butch Vallotton for years and it was worth the wait. This Italian-inspired tactical folder (8.675" overall with a sleek 3.75" drop-point blade) has all the look and feel of a custom-made knife and includes innovative features such as a thumb-stud stop lock. As manufactured knives go, it dosen't get much slicker than this! ABOVE : Variety abounds in the tactical folder marketplace. At top is the Reeve Umnumzaan Kinfe, the Spyderco Valloton Sub-Hilt knife in the middle, and the CRKT Ikoma Sampa knife at bottom. After viewing the CRKT Ikoma Sampa you may want to accuse me of throwing a gents' folder in the mix. It's exquisitely machined handle looks upscale, but the Sampa is plenty large enough (7.25" overall with a 3.125" re-curved drop-point blade) to serve light field duties. Its innovative IKBS ball-bearing system allows the user to access the blade in a blink of an eye. Designed by custom knifemaker Flavio Ikoma, the Sampa will not only perform as a worthy backup but will be the talk among your buddies. If the Sampa is a little too fancy for you, check out the company's Fire Spark model. It's mean looking in an all-black oxide blade finish with G10 handles, incorporates CRKT's OutBurst assisted-opening mechanism, and to puncture the attitude, has a "skull cracker" tip on the base of the handle. View All CRKT Ikoma Sampa Folding Blade Knives: Check price here on our site. View All CRKT Fire Spark Folding Blade Knives: Check knife price here on our site. 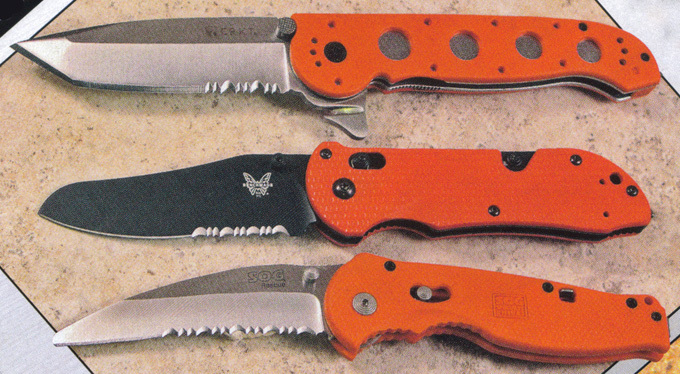 ABOVE : The wicked trio here shows the wide range of blade styles available in tactical folders. From top to bottom: CRKT's Fire Spark, Boker's Haddock, and Benchmade's Mini-Onslaught. The Benchmade Mini-Onslaught, designed in conjunction with custom knifemaker Bob Lum (deceased), is a smaller version of it's big brother. The more manageable, easier to conceal Mini-Onslaught sports a modified clip-point blade of upscale 154 CPM blade steel that has the cool feel of an Iron Mistress bowie. The knife design is curvaceous yet stout, has a 3.75" clip-point blade and a nicely sculpted G10 handle. Users who liked the original but found it too big for the pocket will be delighted with the Mini-Onslaught. View The Benchmade Mini Onslaught Folding Blade Knife (BLACK BLADE): Check price here on our site. View The Benchmade Mini Onslaught Folding Blade Knife (SILVER BLADE): Check price here on our site. Boker hit a home run when they added Denmark knifemaker Jens Anso to their design team. Anso is widely popular worldwide and is known for his sound-yet-unorthodox designs. The newly released Haddock is one of his most popular models and very typical of Anso's groove. This is a frame-lock folder with an upper scale of machined G10 and back liner of 3mm solid titanium. With an overall length of 7.65" and a 3.4" blade, the Haddock knife is a medium-size tactical that can perform a lot of tasks without taking up a lot of your pocket. View The Boker Haddock Folding Blade Knife: Check knife price here on our site. ABOVE :Bigger than it looks, the Mantis Kunitza is a feast of curves from tip to base. Note the concentric pattern machined into the handle. Not just for looks, it makes for great gripping. Mantis Knives has always been an envelope-pusher. With enough curves to make a Corvette blush, the Mantis Kunitza has flair to spare. What's deceptive about the knife is it's size. At 9" fully opened - large by typical folder standards - the Kunitza has 3.5" of that in a swoopy, deeply ground spear point blade. The handle features a concentric machined patternand a blade flipper stands coiled, ready to strike when the blade is tucked in. A large, spacey-looking pivot and pocket clip complete the package for this aggressive cutter. One of the fastest emerging segments among tacticals is in rescue knives. 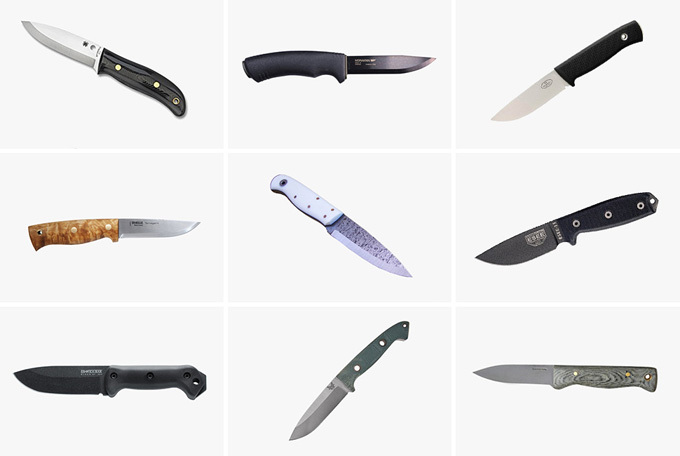 Most of these are folding knives so they can be easily stored, and unlike their oft-stealthy brethren are typically in bright handles. This makes sense, as most have blunt tips to keep from injuring victims and their brightly colored handles make them easy to spot in an emergency situation. Cutting webbing is a key duty for these knives. ABOVE : Emergency rescue folders are a breed all their own. Pictured here are the CRKT M16-12ZER (top), Benchmade Triage (middle), and SOG Flash Rescue (bottom). The Benchmade Triage is an example of just how handy these knives can be in an emergency situation. Built around the manufacturer's sturdy AXIS-lock platform, the Triage features a 3.5" straight-cutting sheep foot blade (with ambidextrous thumb studs to facilitate lefties) and durable G10 handles. A foldout safety cutter — ideal for cutting webbing — folds out from the base and a carbide glass breaker is located on the base. View The Benchmade Triage Emergency Rescue Folding Knife: Check knife price here on our site. The SOG Flash Rescue is a derivative of their Flash series folders, incorporating the company's S.A.T. (Sog Assisted Technology, a speed-assist blade-opening mechanism), which accesses the blade at the flick of the thumb. The 3.5" AUS 8 stainless steel blade has a webbing hungry row of serrations and the tip is blunt to decrease the chance of accidental harm to a victim. The Flash Rescue has a safety catch on the handle to prevent accidental engagement. View The SOG Flash Rescue Emergency Rescue Folding Knife (SILVER BLADE): Check price here on our site. View The SOG Flash Rescue Emergency Rescue Folding Knife (BLACK BLADE): Check price here on our site. CRKT's M16-12ZER rescue folder is a modified version of their popular Kit Carson designed M16 folder which incorporates the company's patented AutoLawks safety system. The conversion includes emergency orange handles, a seat belt cutter milled into the blade flipper, and a tungsten carbide glass breaker incorporated into the base. The M16-12ZER has a 3.75" triple point tanto blade, partially serrated for making quick work of cutting webbing. View the CRKT M16-12ZER Emergency Rescue Folding Knife: Check price here on our site. ABOVE : Think of it as a multitool made just for firearms users. The CRKT Picatinny Multi-Tool was designed in conjunction with Crimson Trace to tackle a myriad of chores, from adjusting scopes to clearing jams. Not necessarily an emergency knife, but one that could be crucial in a pinch, the CRKT Picatinny Multi-Tool — designed in conjunction with Crimson Trace for firearms users is a highly versatile tool for the attachment and adjustment of CTC sights designed for attachment to Picatinny rails. 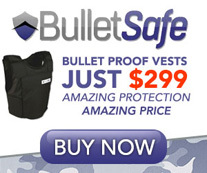 It is also useful for the breakdown and cleaning of automatic pistols and rifles. This knife/multi-tool includes a hex wrench driver with a plethora of bits, foldout blade with scraper edge, and a foldout pin to help clear failure-to-eject jams and remove slide release pins. In addition, two CTC Allen tools are tucked into its molded grooves in the Zytel scales. The main blade is 2.8" in length with a locking liner to ensure a strong lock-up. Multi-tools are extremely handy out on the range or in the bush. With a Multi-tool in your pocket, help is never too far away! View All CRKT Picatinny Multi Tool - The Combat Swiss Army Knife For Firearms Users: Check price here on our site. If fishing is your idea of fun when the deer, pigs or goats are nowhere to be found, you'll be interested in Gerber's Fisherman multi-tool. It has all the great attributes, practicality and quality that make the MP600 series so sought-after, plus unique features designed specifically for those who enjoy fishing. The functionality starts at the flick of the wrist - all that is needed to open the tool with one hand. The extra-long plier jaws have large gripping teeth near the fulcrum. The extra-long needle nose construction with precision grip flat tip and small teeth is ideal for removing hooks quickly and cleanly as well as being ideal for the fine work needed in fabricating tackle. The nickel-plated tungsten/cobalt carbide indexable cutter inserts make cutting tracer lines quick and easy, even in the most awkward situations. The cutter inserts also make preparing tackle simple, allowing clean cuts to even the hardest and heaviest tracer wire. Three sizes of fishing line splicing band crimpers also assist quick and accurate tackle preparation. The Fisherman also includes a carbide fishhook sharpening groove in the double cut file tool. The Fiskars scissors make short work of braided or fused fishing line. Two knives are included - a serrated sheepsfoot blade and a drop point blade. This ideal fishing companion is available for about $200. View All Gerber Multi Plier 600 models: Check multi-plier price here on our site. 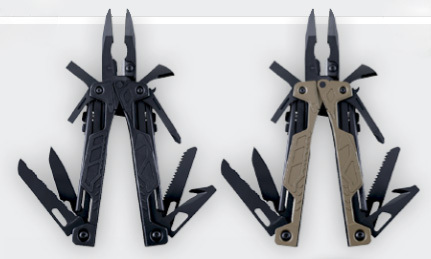 New from Leatherman comes the OHT, the world’s first full size, 100% one-hand operable multi-tool. Packed inside the 11.5 cm frame are 16 tools that can all be deployed with just one hand, including spring action pliers, wire cutters, knife blade, strap cutter, oxygen tank wrench and cleaning rod attachment. 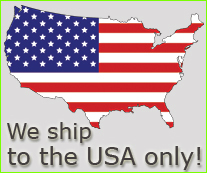 Like all Leatherman tools, the OHT is made in the USA and covered by a 25 year warranty. Available in a black or coyote tan finish.